Dr Fakhruddin Ahmed, a former governor of the Bangladesh Bank, assumed the office of chief adviser (CA) to the non-party caretaker government yesterday based on a consensus between the two major political alliances, beginning the reconstitution of the interim government. President Iajuddin Ahmed, who on Thursday night had declared a state of emergency across the country and resigned from the post of CA amid a growing political crisis over the parliamentary election, administered the oath of his successor at a ceremony in Bangabhaban Darbar Hall yesterday. With Dr Fakhruddin's assumption of the office of CA, resignation of Justice Fazlul Haque, who had been acting as the CA following the resignation of Iajuddin, became effective. The president will now appoint ten advisers in a day or two consulting with the newly appointed CA to complete the reconstitution of the council of advisers to the caretaker government that will initiate a fresh move for holding the next parliamentary election. The Election Commission (EC) yesterday unofficially suspended all activities regarding holding the parliamentary election on January 22 as Iajuddin, who had appointed himself as the CA on October 29 last year, failed to create an atmosphere suitable for holding a free and fair poll. Interestingly, BNP-led four-party alliance which had welcomed Iajuddin's assumption of the office of CA and who had attended his oath taking ceremony on October 29 in Bangabhaban, boycotted yesterday's ceremony of oath taking by the new CA. But, Awami League (AL)-led 14-party coalition and Liberal Democratic Party (LDP) that had boycotted the oath taking ceremony of Iajuddin as the CA, protesting his 'unconstitutional takeover of the post', attended yesterday's function in Bangabhaban. Flanked by senior leaders of the party and its allies the BNP chairperson on October 29 attended the function of Iajuddin taking over as the CA, but none of them yesterday turned up at the ceremony of Dr Fakhruddin taking over as the CA. 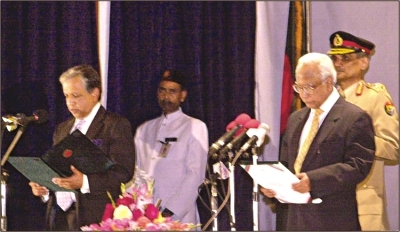 Leaders of BNP and its allies had also boycotted the oath taking ceremony of CA Justice Latifur Rahman on July 15, 2001. AL President Sheikh Hasina and LDP President Prof Badruddoza Chowdhury flanked by other senior leaders of the parties and allies attended CA Fakhruddin's oath taking ceremony. Only Jatiya Party Chairman HM Ershad and some of his party leaders attended both the ceremonies on October 29 and yesterday. Two former chief advisers to caretaker governments Justice Habibur Rahman and Justice Latifur Rahman, Nobel Laureate Professor Muhammad Yunus, Chief Justice Syed JR Mudassir Husain, Acting Chief Election Commissioner Justice Mahfuzur Rahman, secretaries of different ministries, chiefs of three services of the armed forces, foreign diplomats and other dignitaries also attended the ceremony yesterday evening. Excepting the state run media and a private news agency, journalists were not allowed in Bangabhaban to cover the ceremony. Cabinet Secretary Ali Imam Majumder conducted the oath taking ceremony that lasted ten minutes. Before administering the oath, the president appointed Dr Fakhruddin as the new CA in accordance with the Article 58 (C) of the constitution. Before appointing the new CA, negotiations took place between the two major political alliances to reach a consensus on Dr Fakhruddin. Amid the resignation of Iajuddin from the post of CA and Dr Fakhruddin's assumption of the office, it has become a record in the history of the system of caretaker government introduced in 1996 by amending the constitution. This time, the caretaker government has already had two CAs and about to have 24 advisers including the would-be ten advisers. Since the assumption of the office of CA, President Iajuddin had been giving rise to incessant controversies by taking unilateral decisions one after another on electoral issues. In the last 75 days, Iajuddin decided unilaterally three times to deploy the armed forces, appointed two election commissioners --- one of whom had been an aspiring BNP candidate in the next election, made the Election Commission (EC) make a hurried announcement of an election schedule, addressed the nation without consulting the advisers, and transferred some high level officials. Besides, the president on several occasions had remained reluctant to resolve the political crisis in accordance with the council of advisers' initiatives. He was even adamant about holding the January 22 parliamentary election without participation of all major political parties, ignoring repeated suggestions from the advisers and donor agencies that a 'one sided' election will not be credible. As the EC had continued the preparation for holding the election on January 22 in line with the caretaker government's position, AL-led grand alliance announced a series of blockades, hartals and sieges to resist the election, triggering apprehension of violence. Dr Fakhruddin Ahmed was born in Munshiganj. He obtained the first position in his class (first class first) in both BA (Hons) and MA from the Department of Economics in Dhaka University in 1960 and 1961. He received another master's degree in Development Economics from Williams College, USA and the Doctorate Degree in Economics from Princeton University. He started his career as a lecturer of Economics in Dhaka University. Later, he joined the civil service of Pakistan. He served the government until 1978 when he joined the World Bank where he served until 2001. He joined as the governor of Bangladesh Bank in 2001 and his contract expired on April 30, 2005. He has been the managing director of Palli Karma-Sahayak Foundation (PKSF), country's apex micro-finance organisation, since June 1, 2005.